Want to run DXR games on a non-RTX GPU? You'll be able to soon, though it might be a bit slow. One of the biggest complaints with DirectX Raytracing (DXR) games—all two of them—has been the high barrier to entry. You want to run Battlefield 5 or Metro Exodus with ray tracing enabled? You currently need a GeForce RTX card. These are some of the best graphics cards around in terms of performance, but the least expensive card is the RTX 2060, starting at $349, and that card will probably only manage 1080p at high quality and maybe get 60fps if you enabled DLSS. For the full RTX experience, the RTX 2080 Ti is over twice as fast but will set you back $1,200! But what if you just want to try ray tracing without cracking open your wallet? Nvidia has heard the requests and will release a DXR-compatible driver in April. 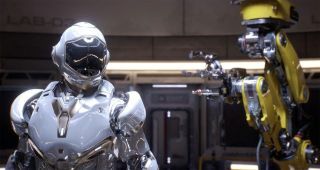 There's a catch of course: even though DXR technically only requires a DX12- or Vulkan-compatible graphics card with appropriate drivers, all the calculations for ray tracing will fall back to the GPU's compute capabilities. Nvidia has previously claimed RTX GPUs are up to 10X faster than their Pascal equivalents, but that's technically only in ray tracing calculations. Turn down the fidelity and maybe ray tracing at 1080p will be within reach of cards like the GTX 1080 and 1080 Ti. We'll be able to do some testing soon enough. One interesting point is that Nvidia did some research into what it would take to run ray tracing workloads at 60fps on a Pascal-type architecture. Because Pascal was designed for DX11 and DX12 but not DXR, Nvidia estimates it would have needed a GPU with four times the computational power of the GTX 1080 Ti, and such a chip would have only been 35 billion transistors and 1324mm^2 in size. That's simply not practical on today's technology—you can't get much larger than 800mm^2. So it created Turing instead. Besides ray tracing, Nvidia's Turing architecture includes a reworked pipeline that allows for concurrent FP and INT execution. In the past, a lot of graphics work relied purely on FP calculations, but INT calculations are becoming increasingly common, particularly with ray tracing algorithms. Depending on the game and the DXR implementation, Nvidia's data shows that the Turing architecture without its RT cores (which is what you'll get in the GTX 1660 Ti and GTX 1660) is still better than Pascal. And depending on how much ray tracing is being done, Turing RTX 2080 may be anywhere from 1.3x-4.0x faster than a Pascal GTX 1080 Ti (and 1.6x-5.0x faster if you enabled DLSS). AMD has also been making some noise about DXR, but so far that's via its existing GPUs. The thing is, AMD's Vega and Polaris architectures have generally been a bit better in pure computational performance than Nvidia's Pascal architecture—it's why DirectX 12 games frequently run better on AMD than on Nvidia. If AMD also puts out DXR-compatible drivers (which seems likely, based on Crytek's Neon Noir demo), that could open the DXR doors to a lot more gamers. Just don't get your hopes up for smooth framerates. As we've already shown in Battlefield 5 and Metro Exodus, while the difference in appearance between traditional rasterization and hybrid ray tracing rendering isn't all that great, the performance hit can be massive. Even a GTX 1080 Ti will likely need to run with low or perhaps medium quality ray tracing effects, at which point it might simply be better to go back to faked approximations. One final related bit of news is that both Unreal Engine and Unity are adding built-in DXR support. Given the number of games built using these engines, going forward games built with Unity or Unreal are more likely to use ray tracing. And for some of the less demanding ray tracing effects, being able to do those with previous gen hardware will be a nice extra.